As he did a year ago, Santa Claus is coming to town! He’ll be meeting and greeting visitors at The Andover Hub (Andover’s old town hall) at 157 Main Street in Andover Village from 2 to 4 PM. on Sunday, December 9. 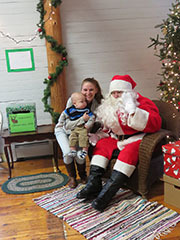 Kids especially may want to come by to have a one-on-one chat with the jolly old fellow, have their picture taken with him, make a wish list and send it to the North Pole, create an ornament for their holiday tree, and get a sweet treat to eat, courtesy of the Andover Service Club. Parents are welcome too, of course. Just drop by at any time between 2 and 4 PM. Sponsored by The Hub, and supported by the Service Club, the event will also give visitors a chance to take note of the steps being taken to repurpose the old town hall as a community center serving residents of Andover and nearby communities. For questions in case of bad weather, call 735-5135. For more information and to be added to the ongoing email list for future activities, send an email to AndoverCommunitySpace@nullgmail.com.